Line provided by Zombie Protestor. It gained sentience because you put the jelly on the bottom. Sin. Comic = The multi-layered "CHOMP" is fantastic. Gregrrs comment also made me laugh. TRUTH! Skimba wrote: The multi-layered "CHOMP" is fantastic. Skimba wrote: Gregrrs comment also made me laugh. TRUTH! Consensus: Nyperold is a bottom-jelly barbarian. Oops, I got jelly all over the handle of my battleaxe. 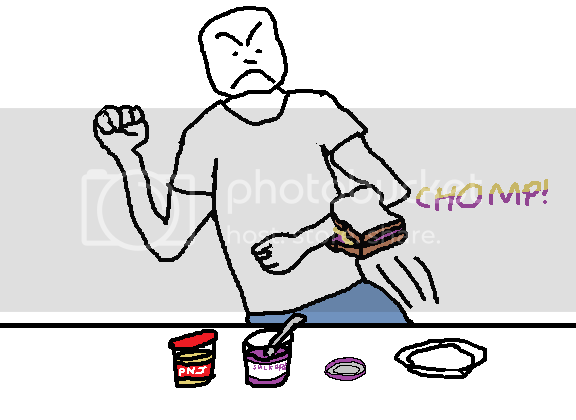 Though seriously, when I initially put a sandwich together, the fruit spread is on the bottom just because it's easier to flip the PB side without losing PB through gravity and failure to adhere. But after that, the fruit spread is on top whenever it's on the plate so that when I pick it up, the peanut butter will be on top again. You're saying you build the sandwich one way, then invert it, then invert it again on every plate->mouth trip? WHAT IS THIS MADNESS? We must teach Nyperold to sandwich! Nyperold wrote: Oops, I got jelly all over the handle of my battleaxe. Actually, Nyp, you may be a wrong-side-up PB&J heathen but we're all brethren of the sandwich as long as you use the right PB. Crunchy, peanuts (and salt) ONLY, no sugar added. In fact, that's what I'm eating right now!! Skippy Natural Super Chunk is my PB of choice. Ingredients: roasted peanuts, sugar, palm oil, salt. I don't see what's so natural about that. Laura Scudder's is the one and only true peanut butter. Roasted (to perfection) peanuts, salt. What's with the palm oil? Are you not willing to put in a little effort for your culinary experience? Also, why add sugar to the peanut butter, when the jelly/jam/preserves already have sugar in them? It's just absurd. Absurd, I say! I'm not familiar with that brand. And looking at the product locator, neither are our stores. Sorry, looks like I'm going to have to stick (*rimshot*) with this for now. Did a quick googleabout, and it seems that Laura Scudder's Peanut Butter (a brand name with which I was unfamiliar) also goes by Adam's Natural Peanut Butter, and the well-known brand name Smucker's Natural Peanut Butter. GregorR wrote: Did a quick googleabout, and it seems that Laura Scudder's Peanut Butter (a brand name with which I was unfamiliar) also goes by Adam's Natural Peanut Butter, and the well-known brand name Smucker's Natural Peanut Butter. No. Laura Scudder's is NOT Adam's, which tastes like they didn't even roast the peanuts. Blech. Some people prefer that, but they're wrong. It's all about the browning reaction. I've not had the Smucker's brand, so I couldn't tell you how it tastes. Yeah, I'm quite sure they're the same. Yes, because they both contain peanuts and salt. Would you say all coffees taste the same because they all contain coffee beans? That's nice. Have you tasted them? Ooh! Ooh! I am vindicated! Also, sorry to derail the thread. It's Teddie or go home. And that's a fact. There's a lot they can do with processing and treatment though that can make the difference. Adam could possibly only roast for 5 minutes in an oven, while Laura could pass theirs over an open flame fueled by hickory as the nuts pass over it on the belt. Let's see, no Wikipedia page, but there is a link on Google search that looks promising... let's see if this New England institution's product is more available in my area than Laura Scudder's. Oh! It goes ahead and tells you what stores carry it without needing a ZIP code input. And I'm pretty sure none of them are in my area. Last edited by Nyperold on Wed Sep 07, 2011 2:52 pm, edited 1 time in total. Well I don't know Adam's from jack but I buy Smucker's and Laura's all the time. Which one I get is a matter of which grocery I happen to be in at the time. And as far as I can tell they're pretty much identical and are both good stuff. I wouldn't touch the Skippy "Natural" with a ten foot (3.048m) pole. The sugar's bad enough -- as loofah says you'll be getting plenty in your jam/jelly/preserves. But palm oil? That tells me the company is selling off the peanut oil and replacing it with palm oil to squeeze out an extra 2¢ profit per jar. As a result you, the consumer, are getting a considerably unhealthier oil in the process. I've tried natural peanut butters and thought they were a little too different. Sorry, but Jif's has exactly the flavor I'm looking for in a peanut butter and I could burn through a jar of it in no time, especially if you give me some tortillas and bananas and/or Nutella. High-five to ZP on the Jif!